So I haven't blogged in what seems like eternity (over a year!!). My new (school) year's resolution is to post at least once a month. That sounds doable, right? 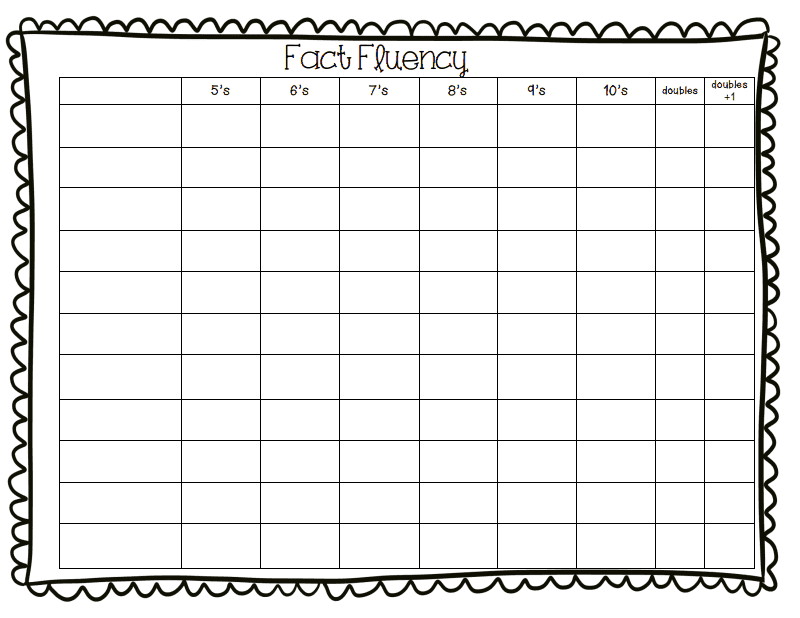 I helped with a little math PD at my school this week and I shared some things I'm using for fact fluency for my little firsties. 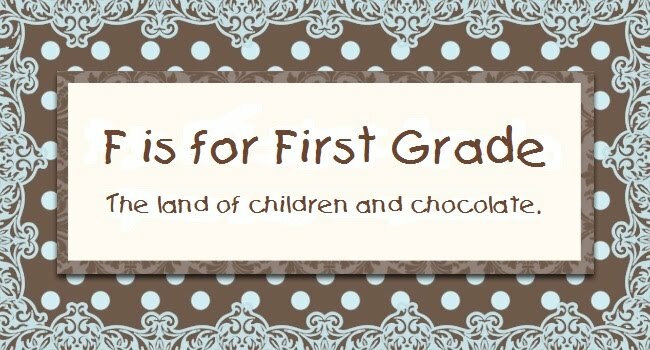 I've loved many of Kathy Gursky's ideas from www.theschoolbell.com for many years. Go check her out (click on number families for math stuff). I've used her fact booklet with my kids for years but this year I changed up the order a little so I thought I'd share it here. My kids keep their fact booklets in their take home folders so it goes home with them every night (no excuse for not practicing those facts!). 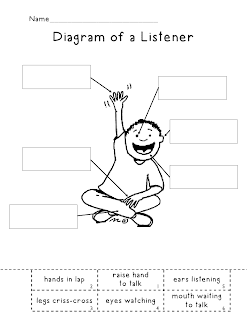 When they pass a set of facts I mark a smiley face in the box so parents will know to move on to the next set. 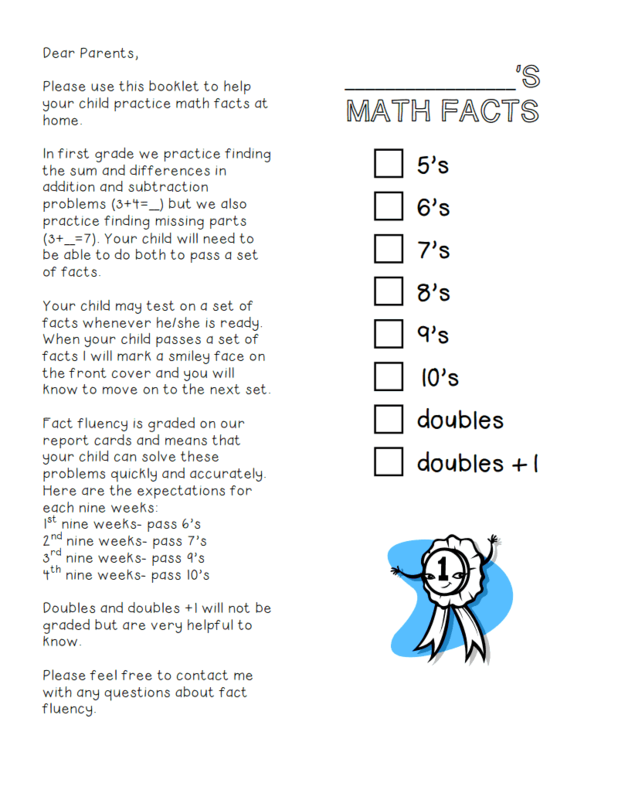 If you want details on how I assess math facts I can post it later but you'll have to wait a month as I'm fulfilling my quota of posts for this month :) Click each picture to download. **Disclaimer- That parent note that will be on the back of the booklet once it's folded is pretty specific to my classroom/school. You may want to type up your own and paste it on top. Sorry this isn't editable. Now for my gameplan for this year. 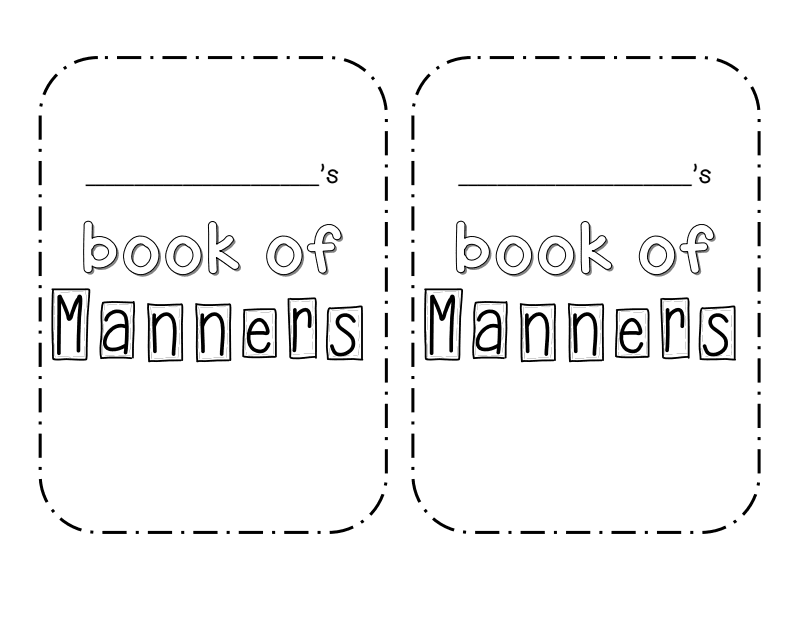 At the end of last year I was thinking of how much my kids needed to practice and use polite manners. After a little searching for a manners unit I decided to just make my own. I finished it just in time since we start school next week, eek!!! 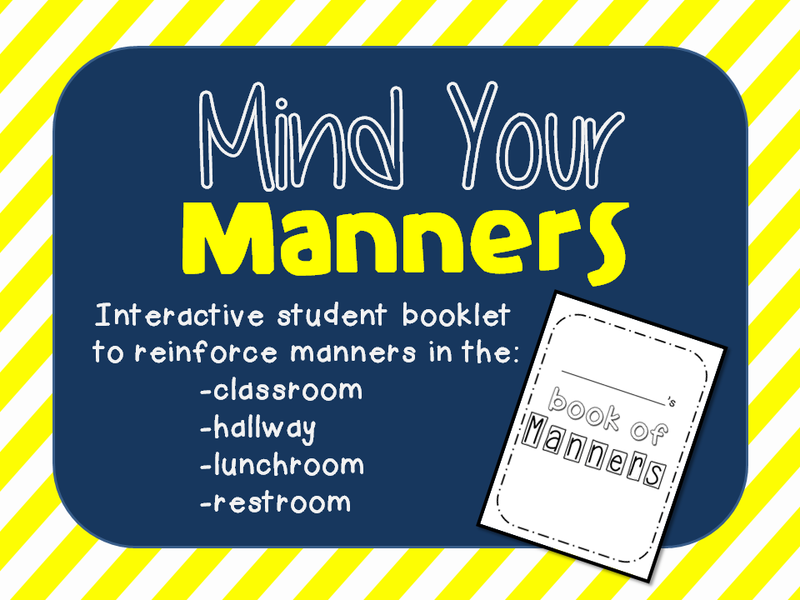 I made an interactive student booklet that will go along with 2 weeks worth of character ed. lessons on manners. We're out of school now, but in case you aren't yet I thought I'd share a little thank you that I did for my custodian. You can never really thank your custodians enough!! I just grabbed some candy and a giftcard at Walmart. Click the picture if you want a copy of the tag (there's one for Junior Mints too). This poor little blog has been forgotten for so long, but I'm back and hoping to get going again! This school year I've been preoccupied and to be honest I haven't done anything great and wonderful that I consider worthy of sharing with anyone. I've been off work since mid February with this little nugget. And now she's grown into this big 7 week old nugget! This week she's begun sleeping 7 hours in a row at night so I think my mind is finally rested enough to get back to blogging, yay! I know it's a little early to talk about end of the year parties, but that's where my mind went. I'm not returning to work until May and by then the year is pretty much over. So I've already started thinking about what I'm going to get my kids and do for our party. Dollar Tree currently has kites 2 for $1!! They may be gone quickly though (sorry friends in my town, I may have bought 30 packs of these and almost emptied the shelf). If your Dollar Tree is out of stock you can order them online but you have to order 45 packs so you'd want to go in with about 3 other teachers. I'm also going to order them each a large beach ball from Oriental Trading. And that's it. Easy peasy with minimal prep work. I got a box of goodies in the mail this week! I was honored to try out a school supply website, MPM School Supplies, and boy am I happy with my new treats. I got a set of three soft dice that have clear pockets on each side. I don't know what I'm going to use them for yet, but the possibilities are endless! Also, post-it notes fit perfect inside the pockets. I also grabbed some 100th day of school glasses (it's never too early) and more transparent counters that I desperately needed to use with the many many math games we play. I placed this order last Saturday and had a box on my doorstep by Tuesday! I am so impressed with the super quick shipping. If you have used any of my Daily Data questions you may have a need for these. In other news...I've been neglecting my blog for a few reasons. 1) School takes up so much time, ya know?! 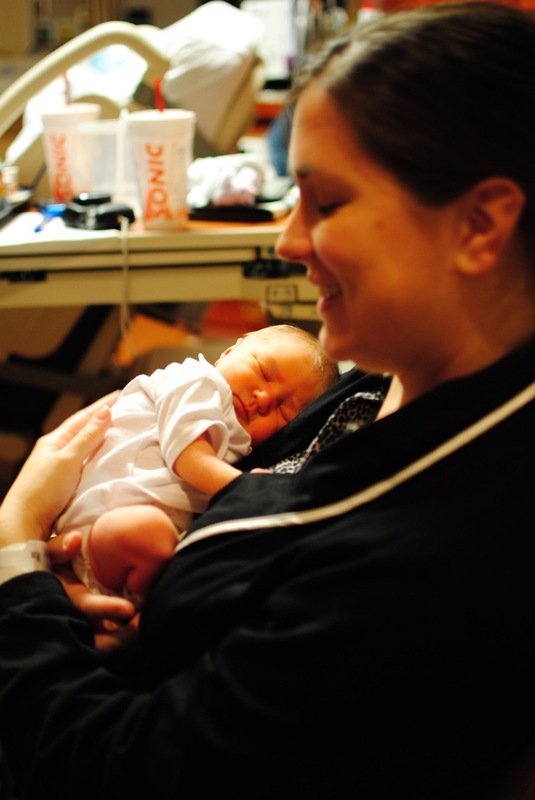 2) I haven't felt super because I must be one of those lucky girls who has sickness her entire pregnancy. 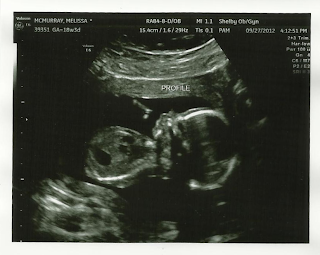 I'm expecting my first baby in February! Hello blog, I'm back! 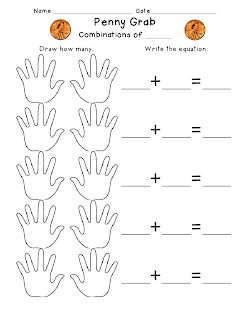 I'm just stopping by to share an activity I'm using next week to find combinations of 10. A friend and I were planning this week and we've been using the "shake and spill" game (see this post about shake and spill) to find combinations but wanted to change it up just a little. You know, keep the kids interested. Add some candy and you have immediate interest! This is two pages so you can print front and back. 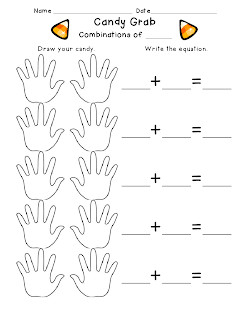 And if you can't handle kids getting sticky hands (or if you aren't allowed to have candy at school...we'll call it a "manipulative") here's a sheet with pennies instead of candy. I've posted about my morning work before, but since it's the start of a new year I'm going to mention it again in case you want to use it too. 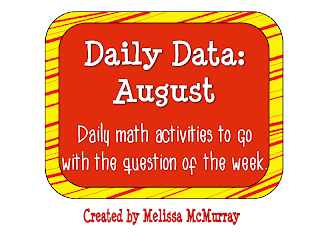 I start Daily Data the first week of school and it just gets a little more complex each month. I just finished putting together my August Daily Data activities. There are five weeks worth of questions to use for August but I hope nobody's started back yet and will need all five! 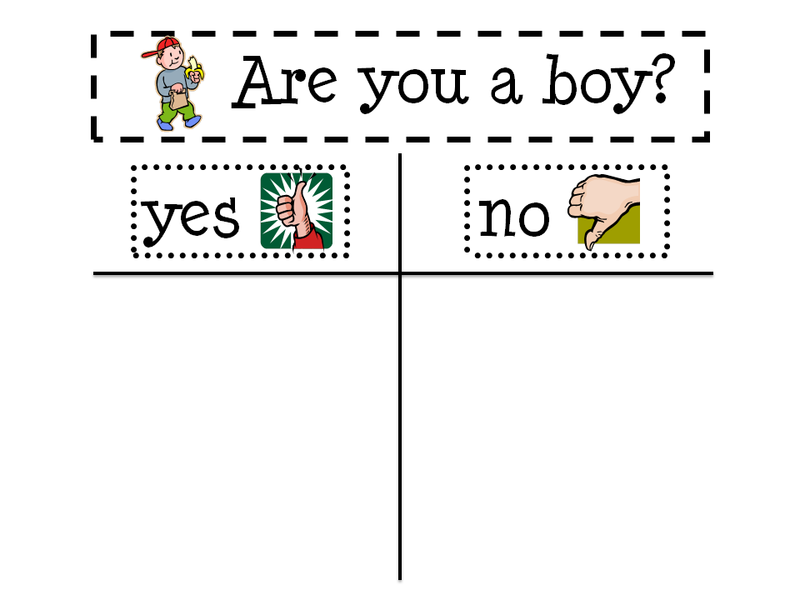 This month all the questions are yes/no and are answered on a T-chart. 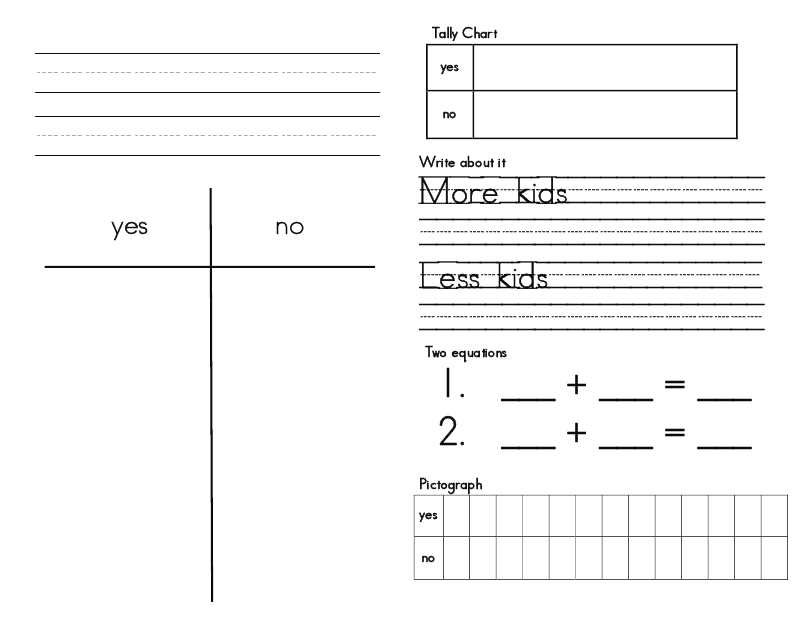 On Tuesday we make a tally chart, Wednesday we write about the data, Thursday we write equations, and Friday we transfer the data to a pictograph. And then we do it all again the next week with a different question. Easy peasy! 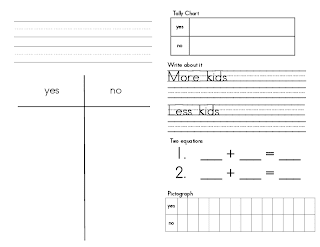 We'll record our data on this page which is cut in half and glued into our math notebooks. If you're interest you can check out the pack on TPT ($2.00).